The community has spoken! In a recent survey you told us you wanted more sublimation print products and we’re here to deliver. 😉 This new product offers both superior quality and $10+ profit margins. Read on to learn how to start creating this exciting new product! Don’t forget you can access all-over print shirts once you’ve unlocked the 15+ new products in the Teespring Launcher. Don’t see this new product in the launcher? Don’t worry! We’re rolling out access to users little by little. A good way to increase your chances of unlocking new products is maintaining a good trust score and increasing your sales. Once you’re granted access we’ll notify you via email. Our tees are produced in the U.S. and feature high-quality, custom workmanship. The shirts are made of 100% polyester jersey and prints are pressed directly into the fabric. Cut and sew assembly ensures the shirts are customized from raw fabric as opposed to being mass-produced—this production method ensures vibrant, beautiful and accurate designs. First, create a listing in the Teespring Launcher. You can add as many product options, colors, etc. as you like. Customize your title, description, URL and launch! 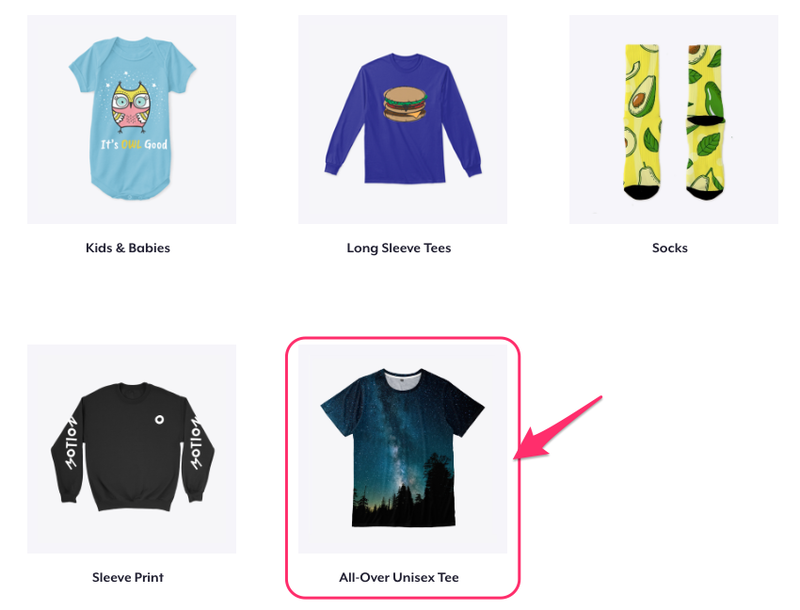 Once your listing is live head back to the Teespring launcher and click the “All-Over Unisex Tee” icon (don’t forget you’ll only be able to see this product icon once you’ve unlocked the new products in the launcher). Fill out the form and submit your listing URL and all-over print tee design file. Make sure to use the design template provided in the form—you must submit a design using the template or your request will not be processed. We’ll aim to get your listing live within the next 24-48 business hours. We’ll notify you once it’s live via the email address associated with your Teespring account. Hi Dony, users are getting approved to start designing all-over print tees on a case-by-case basis contingent upon your past sales and trust score. This is great ! Cant wait for the joggers and hoodies ! Hi Robert, we’re adding access to all-over print tees on a case-by-case basis contingent upon your previous sales and trust score. If you’re not seeing them in your account, it’s because you haven’t been given access yet – and will need to unlock the other 15+ exclusive products before doing so. Hi I would like to request the all over print shirts please. Hey Romy, we’re adding new products to user’s launchers on a case-by-case basis based on your previous sales and trust score. When will the products be available for anyone to design? Hey Tobias, we’re looking to roll these new products out to the masses as soon as we can expand production capacity! Can we design a all over print and ship them in EUROPE ?